Everyone knows that the home designs in coastal locations are very different from any other homes. They are designed to maximize all the benefits of having a home near or on the water. Long Beach Island is no different. We design all of our custom homes to take advantage of the views, with large windows overlooking the beach or the bay. Reverse living designs help us take advantage of those views, while ensuring the lower level (usually garage area) is built on pilings and in accordance with flood hazard elevation rules. But, the most iconic features of shore homes are on the outside of the home! 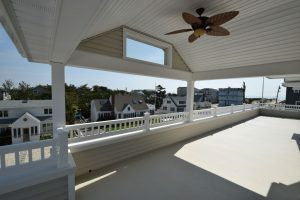 We want to share with you why everyone loves the great porches & decks for custom homes on LBI. With sea breezes blowing through on a warm summer night, and plenty of seating, a covered porch can be paradise to many homeowners on LBI. After a day in the sun having fun, a wonderful grilled dinner (made in a custom outdoor kitchen), a nice glass of wine enjoyed on a covered porch with friends is the best way to end the day. Our homebuyers have been maximizing this outdoor space by adding access from living areas, as well as bedrooms. We’ve also provided screen options for our homeowners, including automatic screens that raise and lower with just the touch of a button! It’s not a matter of a covered porch or a deck, it’s both! Another great way to maximize your outdoor living space is with decks. We’ve done wrap-around decks, roof decks, and decks on both the front and rear of the home. It all depends on your home design, the lot, and the views you want to maximize. Our homeowners choose decking materials that are low maintenance and appropriate for the heat, sun, and sand at the beach, but offer the beauty of a natural wood look. We recommend IPE and Aztec products for all of our decks. Some of our homeowners have chosen glass panels or steel cables rather than rails for their decks, which makes the view virtually unobstructed. Because every home we build is custom, our homeowners have the opportunity to customize their decks, too. 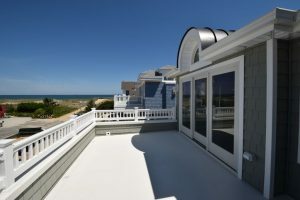 Great porches & decks for custom homes on LBI are two exterior features will always be a critical element of the design. If you are thinking of building a new home in any town on LBI, let us know. We can help you find the perfect location, demo any existing structures, design, and build your new custom home. Contact us today for details or to get started.